BIO: Henry Holland hails from a small town called Ramsbottom, just outside Manchester. At 18 he moved to the bright lights of London, graduating from the London College of Printing with a BA in Journalism. From here he moved onto teen magazines, working as a Fashion Editor. In his free time he began to make t-shirts bearing his ‘Fashion Groupies’ slogans and what started off as a ‘bit of fun’ quickly became Henry’s new career path. HH: I was working in magazines and I absolutely loved it. I actually had no intention of creating anything that would change my career path. I just started making t-shirts for my friends and I to wear as a personal project. I think the authenticity and grassroots nature of the work really resonated with people and the industry – it took off quite quickly! It was very much an idea I had for my friends and I which worked on a wider scale, but that was never my intention and I think that’s why it worked. I think if I had a preconceived marketing strategy to launch the shirts in the way that I launched them, it would have been interpreted as unauthentic and wouldn’t have resonated in the same way. It all happened for a reason. CT: Do you want to create a lifestyle brand? Is this in the pipeline? HH: Yes, for sure. That’s definitely one of the things that I still have to do. Since day one, I’ve always approached House of Holland as a brand and I’ve never considered myself a young designer. I didn’t use my name for House of Holland because I’ve always seen what I’m doing as being about a brand, rather than it being about me. My outlook is that its very much team effort and there’s still so many different product categories and so many areas I want to work in. Watch this space! CT:Where do you obtain your inspiration from? That’s a very difficult question to answer. I think as a creative person you’re sort of like a sponge. You’re constantly absorbing different ideas and concepts and trying to reconfigure them in your head to a way you can translate them through your work – that comes from all different places. I really like to reference films and fictional characters because I love the characterization of fashion. I love the way that you can use clothes to really tell the story of a character almost as much as dialogue. CT: When you look back on your career, what do you feel was your big break? HH:My big break was a happy accident like my entrance into the fashion industry. I made t-shirts with the names of fashion designers on them and I gifted them to my friends, some of those friends were the designers who were the names on the t-shirts. People first saw my t-shirts because Gareth Pugh was wearing it for work and he was so busy he didn’t have time to get changed after his fashion show. Gareth was wearing my t-shirt the night before his fashion show and he worked through the night so he was still wearing it when he came out for his bow at the end of fashion week! I think it was fate and very much meant to be. I believe in that type of thing. CT: What was the best piece of advice you were given when you started out in your career? HH: I think the best advice I had was to remain very authentic and true to who I am. I’m staying really strong on that with what I want to do and say with my work. I think people really forgot the fashion industry is an objective industry. One person’s favorite dress can be another person’s most hideous piece of clothing that’s ever been put out there. You have to remember that not everyone’s going to like everything that you do. So if you build your brand, build your company on a very strong set of rules and a strong DNA, then however much people like or dislike what you do then you can always remain true and authentic to what it is you set out to say in the first place. CT: Do you manage to keep a good work/life balance? HH: I keep an exceptional work/life balance and that’s partly because I love what I do so much. I’m very happy when I’m at work so I very rarely feel the differentiation between work and life. I also get to choose the people who I work with and I choose those people very carefully. I have one of the best jobs in the world and I think that helps you remain positive and happy in what you do. CT: What do you do to relax/switch off? HH: To relax or switch off I exercise because its probably one of the only times my brain thinks about something over than my work. I think when you run your own company, it’s very hard to switch on and off. People ask what hours do you work and the answer to that is the moment my eyes are awake to the time my eyes are closed. Exercise is kind of my chance to switch off. I run a lot and it’s good. Except when I ran two marathons, that wasn’t so good. That was too far. There’s running and then there’s running. That was running. CT: Who have been the mentors/people you have worked with who have been the biggest influence on your career? HH: My parents have been a massive influence on my career. My parents work in very different industries – my Dad is very traditional and runs his own law firm while my Mum runs a château and a training company in positive thought. My Mum runs training courses on meditation and relaxation, she’s very spiritual like that. My parents are at two completely opposite ends of the spectrum, but they both have the exact same approach in that whatever it is I told them I wanted to be, you couldn’t ask anyone to be more supportive as long as I had the conviction and the drive to do it. They would have been happy if I’d have been a bin man as long as I’d worked my way up to driving the truck. That was their approach. It was like just be you and be good at it. CT: When did you first realise you wanted to be Henry Holland, the fashion designer? HH: Still waiting! I don’t really see myself as Henry Holland the fashion designer. I think you just get on with your day-to-day work and your role. I think if you were to pause the TV and ask ‘can we have a chat about Henry Holland?’ you’d be a bit of a d**k. So I try to not focus on any of that. I try to get on with what I’m doing and work hard. I don’t pay attention to anything like that whatsoever. It puts me on any pedestal to says things like Henry Holland ‘the fashion designer’. CT: What would be your advice to anyone starting out wanting to make a career in fashion? HH: It would be to find that authenticity and what it is you want to say with your work. There’s so many brands out there and there’s so many different things going on in the fashion industry, it’s hard to cut through the noise. It was much easier for me ten years ago. I think its really about ensuring you’ve got something to say that is unique and different. The way you communicate that is so important. Just stay very true and authentic to yourself because its so much extra work if you’re having to be something you’re not. That’s a job in itself. CT: What skills do you think are most important to be a success in fashion? HH: You need to be tenacious; have drive to succeed; passion in your work; commit to what you want; a fearlessness to stick with it; and creativity to deliver. 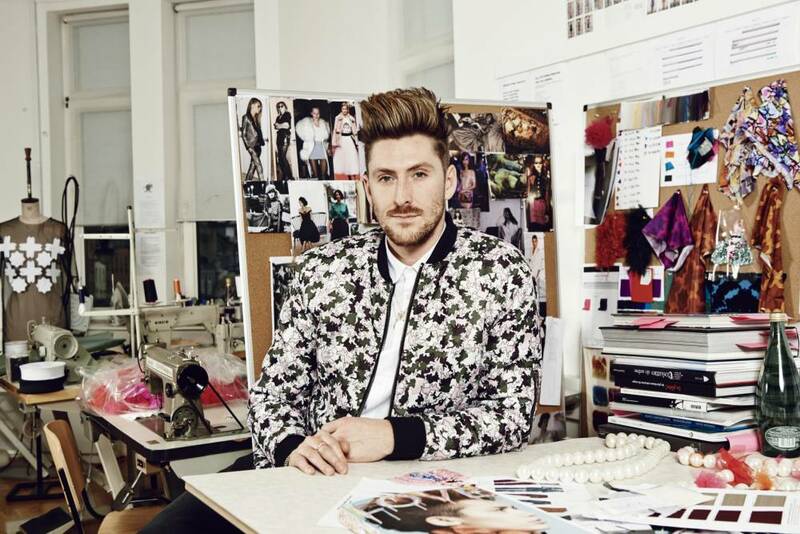 CT: What career advice would today’s 34 y/old Henry Holland give to the 18 y/old Henry Holland? HH: I would definitely say don’t threat too much about your first few jobs. My Mum always taught me that you’ll have seven different careers in your life. I don’t think you should put so much pressure on your first job or two because I think that some people need longer to find out who they are and what they want to do. It doesn’t always happen for everybody during university or during college. It’s important to go out there and experience the world and formulate your life plan from that. There’s no rush. This entry was posted in Interviews and tagged henry holland, Interivew, LFW, Spring 2018. Bookmark the permalink.